Members of the ASU-Kinnaird program pose for a photo. More than 7,900 miles — that's the distance between ASU and Kinnaird College in Pakistan. But for both institutions, the distance was the spark of an educational partnership. Through class courses, workshops and conversations about American literature, ASU and Kinnaird College for Women in Pakistan are partnering to break down stereotypes and bridge cultural gaps between Pakistan and the U.S. According to Carolyn Forbes, assistant director of the center and project coordinator, the project began in 2013, and what was only supposed to be a three-year project turned into a four-year project. 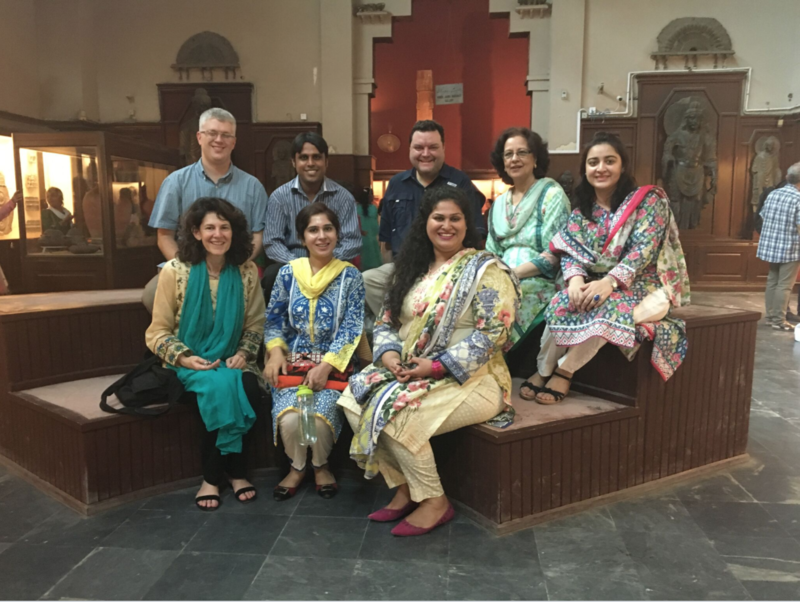 For the past three years, faculty at ASU have been working closely with Kinnaird in Lahore, Pakistan. The goal of the project, called the ASU-Kinnaird Project "Globalizing Research and Teaching of American Literature," is to enhance cross-cultural exchange, build a stronger research capacity among faculty and researchers in Pakistan and increasing knowledge about Pakistan across ASU faculty. The Kinnaird College has been educating women for over 100 years. Their English department is one of the oldest departments in the college. As more Pakistani students gained interest in learning about American literature, the college found an opportunity to expand their department — working outside of Pakistan. The ASU-Kinnaird Project began as an initiative from the U.S. embassy in Islamabad, Pakistan to develop partnerships with other universities in the U.S. The Islamabad state department reached out to a variety of U.S. universities, inviting them to create a partnership with other Pakistani schools. The program involves a network of 22 colleges that collaborate on different academic disciplines. The ASU Center for Religion and Conflict and English department applied for a nearly $1 million grant and got connected with key faculty members at Kinnaird, helping them secure the grant. Faculty from the English department have given lectures and workshops at Kinnaird while also providing online workshops about American literature. The workshops given generally have between 20 to 40 master students involved, and lectures can have up to 150 people. Edward Mallot, associate professor of English and workshop leader, taught workshops on American literature with elements of post-colonial studies at Kinnaird. Mallot and another workshop leader, Lee Bebout, compiled a group of texts that focused on global cities. The purpose of these texts were to create conversations on how cities worldwide face similar issues and relate to Lahore, Pakistan. “The students had an enormous amount of enthusiasm for experiencing more literature in the English language and in return we felt like we were learning a lot about Pakistan,” Mallot said. Faculty from Kinnaird also come to ASU to take special classes in order to learn better researching skills and learn more about literature. Claudia Sadowski-Smith, project director and principal investigator, is in charge of training nine teachers from Kinnaird. These faculty members have come to ASU for a semester over the past three years, and take a course on the globalization of American literary studies and produce a scholarly paper that later gets turned into a conference presentation. Sadowski-Smith said she found the integrated classes enlightening for students to learn about each-others cultures and to learn from one another. “It’s a great experience to have these foreign residents to relate their experiences and their ideas of the United States to (American students) and their own experiences of what’s going on in Pakistan and then vice versa,” Sadowski-Smith said. She said the intercultural exchange of experiences and ideas through literature has been amazing for both sides. Forbes and Mallot both said they felt that a lot of this project was not only about literature but also about breaking the stereotypes that Americans have on Pakistan and what Pakistanis have on the U.S.
“Projects like these are really important because there are so many stereotypes in our way of seeing the other as humans,” Forbes said. When reading a newspaper, Americans view places like Pakistan to be very dangerous and scary, however, on the flip side, when people overseas read about gun violence in the U.S., they view the U.S. as dangerous, Forbes said. “(The U.S.) is not an irredeemably gun toting society and Pakistan doesn’t have a bomb or something every day,” she said. However, Forbes said that literature can reflect many things such as the culture of the place at the time piece was written, to other things like how literature can tell the reader about topics such as gender relations. Through this understanding of American literature and one’s culture, cultural gaps can be broken down. “By reading both literatures of the same time period, you can get a broad sense of how communities were experiencing American culture at the time but you can also see how American culture has changed over time,” Forbes said. Forbes said she has seen many positive outcomes from the project for students at ASU and Kinnaird. “There have been many incredible positive outcomes from the faculty and students at Kinnaird that have participated, but also our own students here at ASU,” Forbes said. Kinnaird’s faculty, for example, was able to advance their knowledge of American literature and incorporate that knowledge into their existing literature classes. Forbes also said the project also allowed students to improve upon their research and get accepted into conferences such as the South Atlantic Modern Language Association conference. As for ASU, Forbes says the grant allowed for three graduate seminars to be opened to Kinnaird faculty and ASU students. The classes advanced conversations about the global dimensions of American Literature and helped broaden the student’s views on one another’s culture.